I am a long time member of the cult of multiple monitors. And the practice is really taking off. But the NYT has it all wrong. One of the best set ups I ever had years ago was two wide-screen 19″ monitors on adjustable arms so I could keep one horizontal for email and web and turn the other one vertical for all the document and text-based work I was doing during that period. I currently spread my work out across two extremely hi-resolution 27 inch monitors. At 2560 pixels wide and 1440 pixels high, each of these is roughly equivalent to three of the state of the art 19″ monitors from not that many years ago. Sounds like a lot of real estate, but I use every square inch. Certainly more people are trying [multiple monitors]. 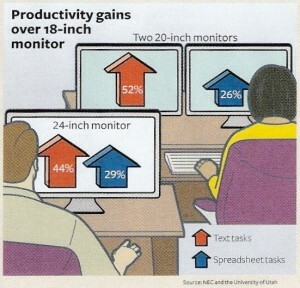 Tech firms sold 179 million monitors worldwide last year and only 130 million desktop computers — meaning “more screens per desk,” said Rhoda Alexander, who heads monitor and tablet research at IHS iSuppli… NEC Display, a major supplier of monitors, said 30 to 40 percent of the employees of its corporate customers now used more than one monitor, up from 1 percent four years ago. 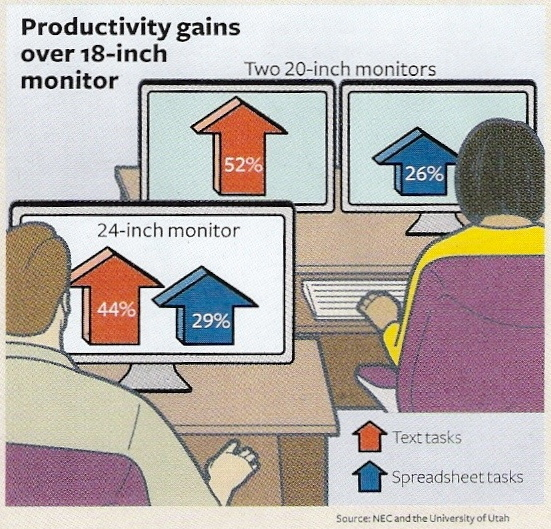 As someone who has long appreciated the productivity gains, this does not surprise me. But one aspect of the article does annoy me. Workers in the digital era can feel at times as if they are playing a video game, battling the barrage of e-mails and instant messages, juggling documents, Web sites and online calendars… But there is a growing new tactic for countering the data assault: the addition of a second computer screen. Or a third. This proliferation of displays is the latest workplace upgrade, and it is responsible for the new look at companies and home offices — they are starting to resemble mission control. The issue I have with this logic is that it equates having an application unburied and visible on your desktop with multi-tasking. By the author’s logic, having a bigger desk to spread out on would make someone less productive. The logic here would seem to be that productivity might only come from having everything on your tiny desk piled into one stack and all your work focused only on the top item in the stack at any one time. Imagine having to rifle through a stack of papers like that to do any of the typical productivity tasks we take for granted today. Someone emails you a document you need to open and scan through. Someone send you a note inviting you to a meeting, requiring you to check your calendar. Someone sends you a link you need to look at. The reality is that most of the tasks in our modern work flow involve multiple steps and multiple applications. We are not multi-tasking, we are multi-stepping one task. Having more space on the screen simply makes that faster. If you can spread out, it allows you to glance at the calendar and instantly respond to the email, without even taking your hands off the keyboard. It allows you to open the attached document, grab a section, and send it right back with comments. It is just like spreading out at a big table to organize a project. It is how we work. Time spent switching between applications is a frustrating waste. And this is why for me, doing serious work on a laptop, tablet or smartphone is a painful last resort. In recognition of this fact, Apple has recently made some serious improvements with the Lion version of Mac OSX. It is now possible to run each application in full screen mode and simply switch between apps with a fast swipe of the fingers. It’s a huge improvement, but it still requires a break in the flow and more mental resources to hold the bit of data in your memory buffer while you switch, rather than simply referring to it as you type. Nowhere near as fast, nowhere near as pleasant. To the author’s point, sure, you could probably clutter up your multi-screen real estate with tons of twitter and facebook streams and other distractions, just like you could cover your desk with distracting desk toys. But that’s a personality thing or work style thing, not a monitor thing. And on my big monitors, that’s not how I roll. One thing I will admit, though is that working late at night on two huge screens is a recipe for a poor night’s sleep if you don’t get into the habit of turning the screen brightness way down in the evening. That much of your field of vision being bombarded with very strong light has been shown to have a stimulative effect on a user’s alertness and a potential effect on their biological time-clock. So I am very careful to turn the brightness as low as I can in the evenings.